my great-grandfather max was obviously a cutting-edge sort of guy. 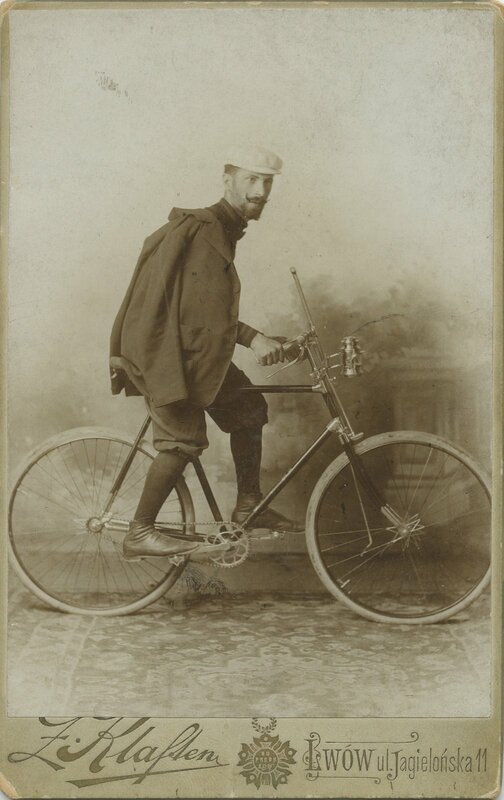 here he is on his safety bicycle and sporty cycling outfit in maybe around 1895, which would make him 20 in this undated photograph. bicycling was, at this time, quite the thing to do among the upper and middle classes all over america and europe and i feel like this photograph of max on his bicycle was probably taken to commemorate how very fashionable he was, just as someone might pose for a photograph with their fancy car today. i personally think that max is one of my most adorable ancestors and the stories i have heard about his kind heart seem to amply back this up. one of the youngest of 16 children, born to a wealthy family in l’viv, ukraine (then, lemberg, austria), max emigrated to the u.s. in 1899. the family lore says that this was so that he could escape compulsory service in the austro-hungarian army. i am not sure if this can actually be true, because the internet informs me that the universally compulsory military service within the austro-hungarian empire began at age 20 and lasted 3 years, after which came an additional 9 years in the reserves. since max was 25 when he came to the united states, he was probably not evading this initial conscription but it is possible – i guess – that he could have been avoiding being called up as a reservist. whatever the case (and i really wish i knew what it was), max settled in york, pennsylvania where he became a tobacco wholesaler. as i have written before, max married my great-grandmother anna in 1905 at which time he was living in what the clerk filling out the marriage license noted as “redelheim, pa.” for a while i puzzled over this – wondering why i couldn’t find what i supposed must be a small german enclave called redelheim anywhere in york county or, for that matter, in all of pennsylvania. then i realized (or perhaps someone pointed it out to me) that redelheim and the german pastoralism that name somehow evoked in me was a sort of mondegreen perpetuated by a clerk who (and i don’t blame him) didn’t realize max and his austrian accent were actually saying “red lion,” a town in york county that most assuredly does exist. max and anna lived in york with their three children – arthur and ethel, who lived to grow up, and william, who did not – as well as an occasional influx of nephews from l’viv who had also come to the united states (whether to escape army service or to find opportunities not available to them in europe, i am not sure). the son of nephew joshua z. stadlan told me that his father lived in york with max and anna (and ethel) for a short time after his arrival in the u.s. in 1921. max wanted joshua to stay and live in york, to join him in the tobacco business as a son, a gesture of generosity and open-heartedness that i see with a certain level of sadness and longing to it. this kind little (and he was very small) man, physically distanced from the large family that he grew up with and left with only a tiny family circle – with a often-ill hypochondriac wife and two children greatly separated in age with the ghost of a dead brother between them – must have yearned after the chance to invite in his brother’s and sister’s sons, to expand his local family fold and restore something of the close big family of his past. though joshua went his own way as a labor organizer and jewish educator, he always (i was told by his son, emanuel) thought fondly of his uncle max and his cousins, keeping in touch over the years and various distances that separated them, as did emanuel himself. joshua and his wife bessie even had a tree planted in israel on the occasion of my first cousin eric’s birth in 1977, which i know because my grandmother kept the certificate in a box with other mementos. max’s same gesture of openness greeted the nephews who came to america after joshua. even though no one has told me this verbatim, i am sure that it did. both of those other nephews – dorian and henry, brothers who came to the u.s. at different times – were very close with max and his children, and though dorian didn’t live in york with them, he did work in the tobacco business and spend a large-ish amount of time around his little cousin ethel, who had a huge crush on him (a story for another day). max instilled the importance of family into his daughter, a girl who grew up without grandparents and cousins her own age, whose address books from the 1930s thru the 1960s now live in my closet and are filled with the locations and birthdays of cousins and relations i never realized she had known. and i am glad that this value of max’s has also spread its way to me. i am sure that he would be happy to know about the way i and his distant acht cousins have rediscovered and redrawn the family bonds that connect us. i am also pretty sure he would be slightly disappointed that my sister does not know how to ride a bicycle. my family seems boring (though I’m sure they have secrets too that no one has bothered to look up yet). either way, this bicycle picture is my favorite and I want to know more. damn, i had no idea you had a “i am a crazy collector of family stories and photos” blog!!!!! lady, you are wild. i am sure they’re not as boring as you think, miss m. i am a huge fan of this bicycle picture too.lou, what can i say? i am a woman of many talents and many secrets. AHH! i love love love that picture of the bicycle. amazing. you are inspiring!! yes yes you are! thanks maura! that is very nice to hear.